At the O’Reilly Software Architecture Conference I gave a five minute summary of serverless development, introduced the Apache OpenWhisk open source project, and showed how to get started with OpenWhisk on IBM Bluemix. This post is a transcript of that talk. Following increasing abstraction away from bare metal over the years, new serverless platforms like OpenWhisk and Amazon Lambda enable developers to focus more on their key business logic—written as ever smaller pieces of code, or functions — rather than its supporting infrastructure. “Serverless” has emerged as the term for this deployment model because the developer point of view — and his or her concerns — have shifted away from operating the infrastructure that supports the code. That, and because the code isn’t always running on a server at all. But more on that later. These new serverless platforms help developers build well-designed, cloud-native applications more easily by offloading many of the operational best practices recommended by the 12 Factors. 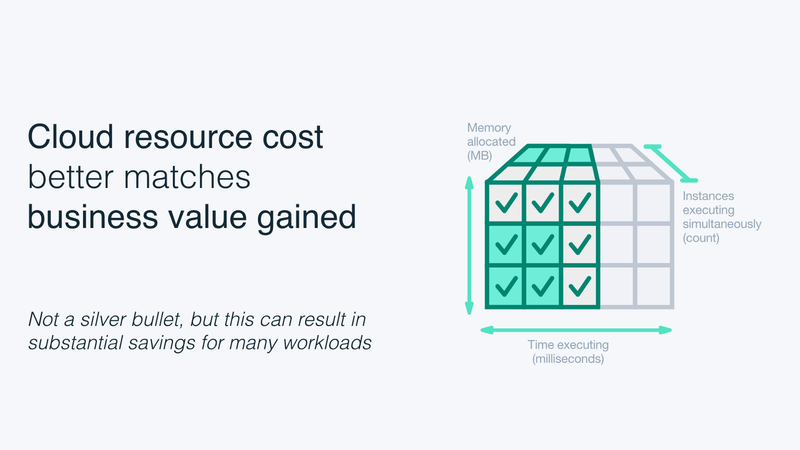 This is particularly true in the areas of application scaling, container lifecycle management, and workload concurrency — which can quickly get out of hand once they go all in on microservices. But there are also many more types of applications that aren’t the common type of HTTP-based microservice that also can benefit from cloud platform elasticity. These include data processing, IoT, chatbots, and batch jobs. 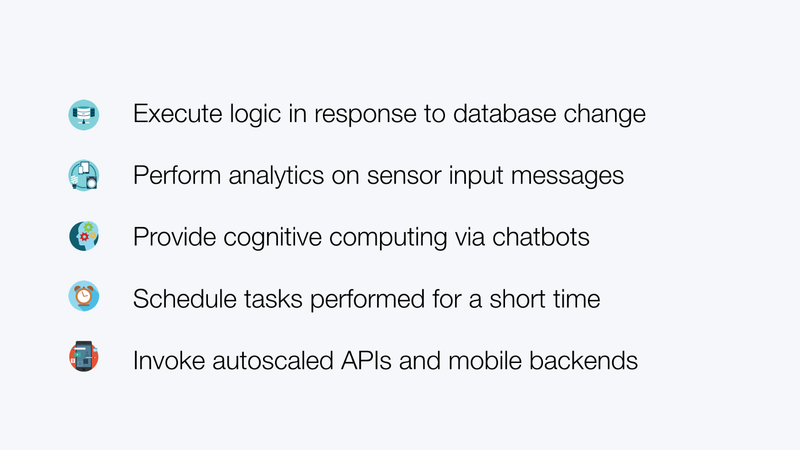 These workloads are a good fit for the event-driven model that serverless platforms provide through support for different protocols (MQTT, for example) and asynchronous (non-request/response) interaction models. A new cost model is emerging along with serverless architectures. One that ties code execution time directly to the price developers pay for services. This is where the second aspect of the term “serverless” comes into play, as code isn’t running and therefore consuming resources while idly waiting for requests. Simon Wardley provides a deeper look at the implications of this. While serverless architectures aren’t a silver bullet, and there are dragons as Mike Roberts notes, they do provide a new developer tool and deployment option for many use cases. So how can you actually start to develop and deploy serverless architectures today — and begin to take advantage of these new technical capabilities and cost models? 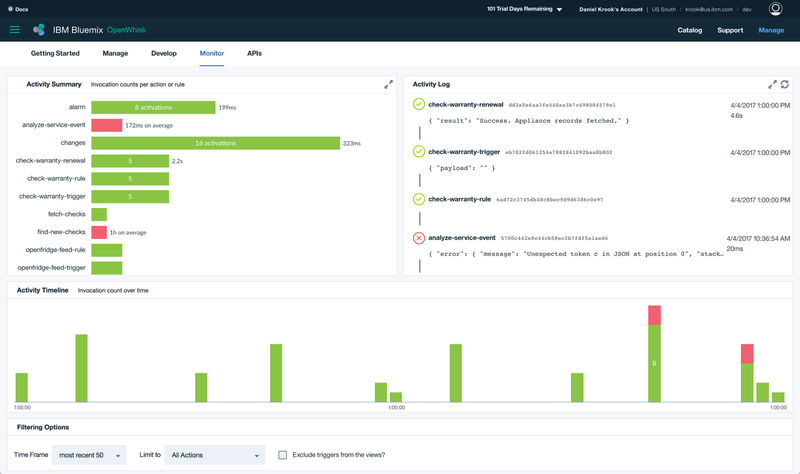 Apache OpenWhisk, an open source project started by IBM 18 months ago and in production on Bluemix since December, provides one such platform for building them. 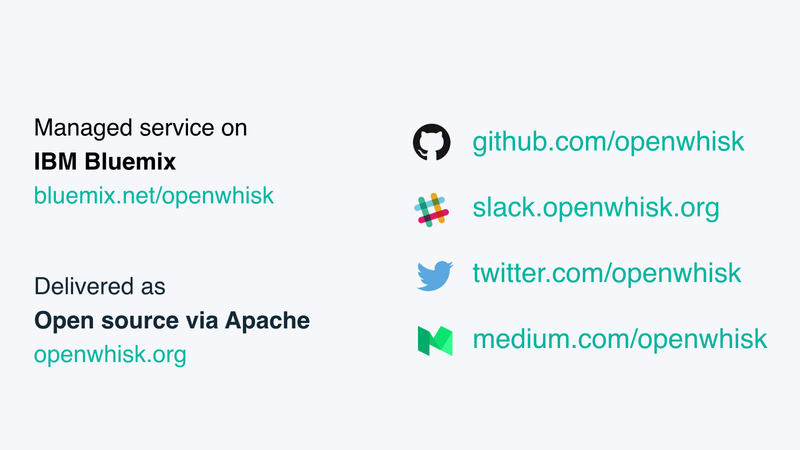 OpenWhisk is flexible, extensible, and integrates with a variety of internal and external event sources, which are its key differences from Amazon Lambda, Google Cloud Functions, and Microsoft Azure Functions. 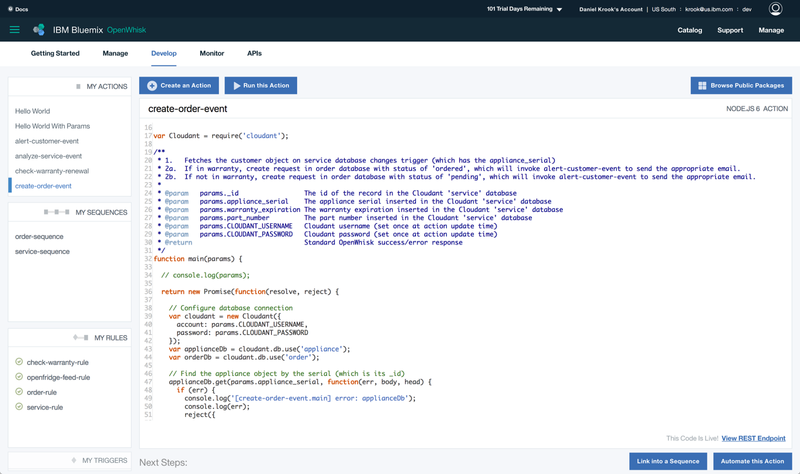 OpenWhisk offers the developer — that person with the serverless point of view I mentioned earlier — a straight forward programming model based on 4 concepts: packages, triggers, actions, and rules. Packages provide event feeds. Triggers associated with those feeds fire when an event occurs, and developers can map actions — or functions — to triggers using rules. Behind the curtain there are servers to run your serverless applications, of course. The developer doesn’t care about them, but those interested in the inner workings of the platform will. 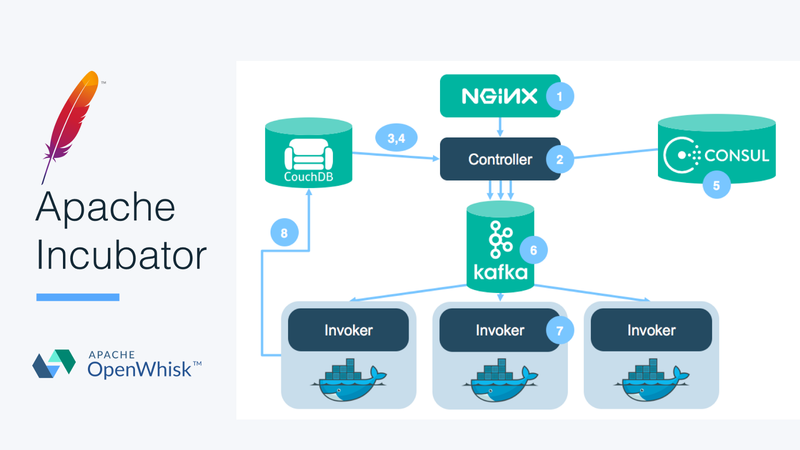 OpenWhisk is a distributed system built on top of proven, cloud-native, open source technology such as NGINX, CouchDB, Consul, Kafka, and Docker. You can run the platform using Vagrant on a workstation or deploy it on premises with OpenStack, for example. Apache OpenWhisk is available to end users as a hosted service on IBM Bluemix (and possibly in the future, from Adobe and others as well). …as well as a visual monitoring console — over and above the Apache OpenWhisk open source platform. 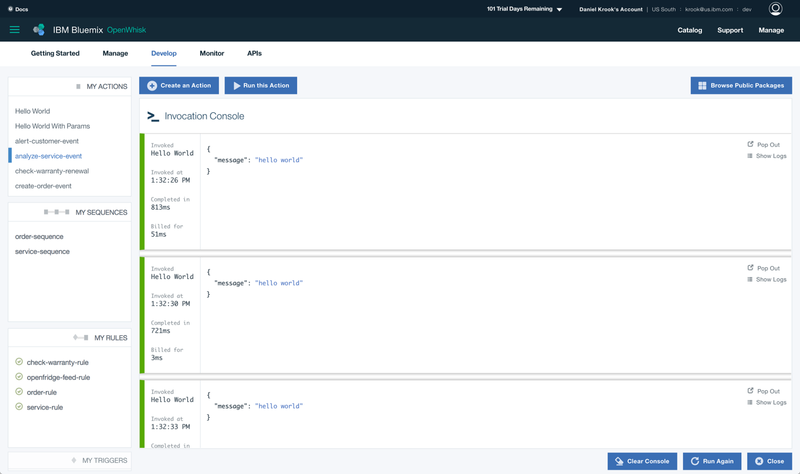 If you’re interested in building your first serverless application, try OpenWhisk on IBM Bluemix. If you’re interested in the underlying open source project, or packaging your service for others to use, check out the Apache project. Developers like myself are always willing to help, and you can meet other community members through our social media channels. Daniel Krook is a New York-based Software Architect, Distinguished IT Specialist, Master Inventor, and member of the IBM Academy of Technology. He works with customers and the community to create first-of-a-kind cloud solutions based on the OpenStack, Cloud Foundry, Docker, and OpenWhisk open source projects. Most recently, Daniel has been building bots and IoT solutions backed by serverless, event-driven cloud architectures. Find him on Twitter, GitHub, LinkedIn, SlideShare, and Lanyrd.